The 1873 Modoc War was the most expensive Indian conflict in American history, and the only one in which a general—E. R. S. Canby—was killed. 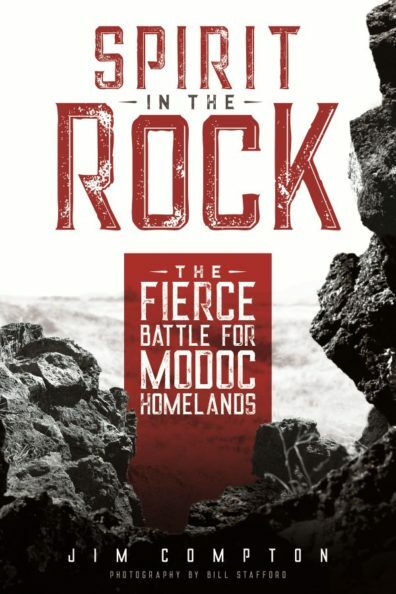 Now, utilizing his skills as an award-winning broadcast journalist, author Jim Compton (1941–2014) tells the story in the newest title from Washington State University (WSU) Press, Spirit in the Rock: The Fierce Battle for Modoc Homelands. Following his sudden death, the author’s wife, Carol Arnold, a retired trial attorney, fulfilled his ambitions with a final edit and submission for publication. Veteran correspondent Compton’s narrative examines events and experiences from a variety of angles, including those of Modoc warriors, army foot soldiers, and cavalry officers. Forced to fight for their ancestral territory in a brutal, bloody, and unjust dispute, the Modoc utilized guerilla tactics against the U.S. Army from a naturally protective setting—lava beds in what is now northern California. They fended off attacks by roughly a thousand soldiers, humiliating army troops and challenging their leaders. During peace negotiations, a charismatic Modoc chief known as Captain Jack fatally shot Canby. Four of Jack’s comrades betrayed him, he was captured, and the war ended. Captain Jack and three others were quickly tried and hanged at Fort Klamath. Spirit in the Rock breaks important new ground as it analyzes underlying causes of the war. For the first time, the book details the schemes that ultimately drove the Modoc from their traditional homelands along the Lost River, calling attention to the intimate relationship between the Applegates and Frances Fuller Victor, whose flattering portrait of the famous Oregon pioneer family in various historical annals clouded understanding of the Modoc War for over a century. A preface by respected educator and member of the Navajo Nation, Vivian Arviso, illuminates ways Native American traditions and spirituality influenced events. She also explains that the existence of the Modoc people today is a tribute to Captain Jack’s leadership, the participation of women and children in defending their land and livelihood, and the Modoc cultural spirit. In addition, historian Boyd Cothran’s afterword describes how the Modoc War shaped national perceptions of the Native American fight for survival in the West. Original black and white photographs from the author’s private collection illustrate the story, and color images by Seattle photographer Bill Stafford reveal a contemporary view of Modoc Country. Text and maps highlight the army’s strategies as well as the brilliant maneuvers made by Modoc warriors. Meticulously researched and footnoted, with an extensive bibliography, the book also explains why the U.S. Attorney General ordered a military tribunal to try Captain Jack as a belligerent of a foreign power. One hundred and thirty years later, the George W. Bush administration cited this precedent to justify rendition and military trial of terrorists. Washington State University Press is pleased to announce that All for the Greed of Gold: Will Woodin’s Klondike Adventure, has won the 2017 Mary Lee Spence Documentary Book Award. The prize was announced at the award banquet at the Mining History Association’s annual meeting held in Fairbanks, Alaska on Friday, June 16, 2017. Winning editor Catherine Spude attended. Established in 2013, the biannual honor recognizes mining history books that are edited works, compilations of documents (letters, previously unpublished manuscript reminiscences, oral histories), or significant photograph histories, or related genres. The winning author/editor receives a $500 cash prize. William Jay Woodin was on board when the steamship Cleveland left Seattle’s docks on March 1, 1898, traveling with his father and several others. It was the nineteenth century’s last great gold rush, but rather than mine, they planned to earn their fortune by providing supplies. Unlike many stampeders, Will’s party chose to take both the White Pass Trail and the Tutshi Trail, and his story offers a rare glimpse into ordeals suffered along this less common, seldom chronicled route. Part of an emerging middle class who, with minimal formal education, left farm life to seek urban employment, Will’s experiences epitomize the story of how working-class men endured a grueling Yukon journey. Whether packing tons of goods on their own backs or building boats at the Windy Arm camp, his accounts bring to light the cooperation and camaraderie necessary for survival, and his simple yet perceptive observations reveal much about how the average Klondike stampeder lived, worked, and struggled to overcome hardships. Enhanced with family photographs and skillfully edited, Will’s writings—including diaries, a short story, and a candid 1910 memoir—record events, emotions, and reflections, as well as his youthful wonder at the beauty surrounding him. He provides specific descriptions of trail conditions, extreme weather, travel hazards, and social relationships as the horde of thousands climbed the White Pass and floated down the Yukon to Dawson. He describes the workings of the gold fields and the economics of minimizing risk. Spude’s expert integration of the autobiography and selected journal entries places the young stampeder’s views within the context of the era’s value systems, economics and social structures, and illuminates what memoir writers sometimes fail to discuss when crafting personal narratives. A historian and archaeologist, she has written popular history for magazines and newspapers as well as numerous journal articles. Her book about the legend of Soapy Smith was a finalist for a Western Writers of America Spur Award. PULLMAN, Wash.— The 1970s and 80s saw a cultural shift in prisons across the country, but only one became the archetype of failed reform. That singular institution was the Washington State Penitentiary in Walla Walla. Reports of shocking incidents there were splashed across newspapers and television screens nationwide. For the first time, Unusual Punishment: Inside the Walla Walla Prison, 1970–1985, tells the complete story—one of the most bizarre chapters in American prison history. PULLMAN, Wash.— May 18, 2015 marks the 35th anniversary of Earth’s largest terrestrial landslide in historical times—a result of a restless volcano and a uniquely violent eruption. The top of Mount St. Helens plowed into Spirit Lake, throwing water 860 feet above lake level, a great inland tsunami. A ground-hugging hot surge sped across valleys and ridges, killing dozens of people and nearly all other life as it leveled 234 square miles of forest. PULLMAN, Wash.— Levi Scott and his friend James Layton Collins completed the original manuscript for Wagons to the Willamette: Captain Levi Scott and the Southern Route to Oregon, 1844 –1847 in 1889. It is the only first-hand account written by someone who not only searched for the alternate route but also accompanied its first wagon train. we Set out at 3 oClock and proceeded on up the Travelers rest Creek, accompanied by the flat head or Tushapaws Indians . . . Encamped at some old Indian Lodges, nothing killed this evening hills on the right high & ruged, the mountains on the left high & Covered with Snow. This is how Encounters with the People: Written and Oral Accounts of Nez Perce Life to 1858, an edited, annotated anthology of unique primary sources related to Nez Perce history, begins. Most of the selected material—Native American oral histories, diary excerpts, military reports, maps, and more—is published for the first time or is found only in obscure sources. PULLMAN, Wash.— Long overshadowed by his older brother Edward’s fame, Asahel Curtis (1874–1941) produced some 40,000 images chronicling a broad swath of early 2oth-century life in the Northwest. In Developing the Pacific Northwest: The Life and Work of Asahel Curtis, the first full-length biography of the photographer/booster/mountaineer, scholar William H. Wilson takes an in-depth look at Curtis and corrects some longstanding misconceptions. PULLMAN, Wash.— Wild Place: A History of Priest Lake, Idaho offers the first comprehensive, accurate chronicle of Priest Lake. Author Kris Runberg Smith’s family has had ties to the area since her great-great grandfather, a timber cruiser, arrived in 1897. Yet despite being a location one local newspaper branded “a cult with many vacationists,” no one had properly recorded its history. PULLMAN, Wash.— WSU Press has recently released Yellowstone Summers: Touring with the Wylie Camping Company in America’s First National Park, by Jane Galloway Demaray. The book tells the story of the Wylie Camping Company and how the owner’s unswerving efforts helped develop, define, and preserve tourism in Yellowstone National Park. PULLMAN, Wash.— Washington State University Press has just published River Song: Naxiyamtáma (Snake River-Palouse) Oral Traditions from Mary Jim, Andrew George, Gordon Fisher, and Emily Peone, a new collection of Native American oral histories. For many generations into the twentieth century, Mary Jim, her family, and their ancestors lived a free and open life on the Columbia Plateau. They journeyed from the Snake River to Badger Mountain to Oregon’s Blue Mountains, interacting and intermarrying within a vast region of the Northwest. Denied a place on their ancestral lands, the original Snake River-Palouse people were forced to scatter. After most relocated to the Nez Perce, Umatilla, Warm Springs, Yakama, and Colville reservations, maintaining their cultural identity became increasingly difficult. Still, elders continued to pass down oral histories to their descendants, insisting youngsters listen with rapt attention. Intended as life lessons, these sacred texts contain many levels of meaning and are rich in content, interpretation, and nuance. The filming location for the popular TV series Northern Exposure, Roslyn, Washington, might not be as eccentric as its fictional counterpart. But the seemingly sleepy little town does have a dramatic past and lingering bitter sentiments that some residents didn’t want exposed. With family roots that lead directly to Roslyn, David Bullock, the author of Coal Wars: Unions, Strikes, and Violence in Depression-Era Central Washington, spent considerable time there—but all of it was long after a 1934 incident prompted a New Republic writer to dub the town a “little nest of Fascists.” Bullock wanted to understand why, at that moment, the community was such a tinderbox, and he made some surprising discoveries along the way. In the 1930s, members of radical labor movements often opposed each other, yet he unearthed attempts at cooperative efforts between Communists, Socialists, and the Industrial Workers of the World. He also found elements of a David and Goliath story, with fierce local leaders pitted against powerful national interests. Some Central Washington residents warned Bullock to avoid the topic. Even decades later, they consider the region’s labor history to be controversial and many have intense reactions when interviewed. One source refused to provide a college paper he wrote in the 1970s, asserting individuals within the community could still be hurt by its contents. 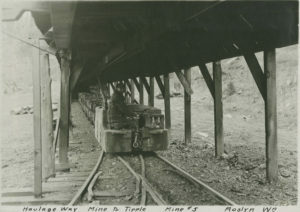 Roslyn had always been a coal town, ever since a railway company opened the first mine in 1886. On a normal shift, the miners spent ten or more hours at the workplace. Bullock’s grandfather, an immigrant, was one of many who dressed, prepared lights and equipment, and traveled in and out of the mine shaft on his own time. Some trips took nearly an hour each way. In the early 1930s, concerned about safety, locals demonstrated at the state capital. Their success prompted additional dreams of better working conditions, fair wages, and a six-hour workday. They expected their national labor union, the United Mine Workers of America (UMWA), to remain strong during contract negotiations. Instead, UMWA leaders aligned with the coal company, setting the stage for the rise of a new local organization, the Western Miners Union of America. With the United States in the midst of a severe national economic depression, the fledgling group faced opposition from their old union, a powerful railroad empire, and even their own government. The conflict between the Western Miners and the UMWA intensified, leading to murder on a Roslyn street corner. When the killer was acquitted, community outrage rose, and Communist activists and other radical labor groups offered to back the Western Miners. The Western Miners called for a strike on April 3, 1934, but this time the unions themselves were rivals—dividing families, pitting neighbor against neighbor, and turning residents of Roslyn, Cle Elem, and Ronald against each other. At the picket lines, ordinary wives, mothers, sisters, and daughters pelted cars with rocks, rotten eggs, pine cones, and cow pies. They cursed and shrieked insults as they fought on behalf of their men. As the morning wore on, the taunts and assaults escalated. Officials called in the state police. David Bullock made a concerted effort to keep his account balanced. He conducted interviews with local residents and reviewed newspapers, court documents, and corporate archives. Capturing the details surrounding a dual union movement in the 1930s American West, his narrative also describes the region’s melting pot of working families and the socio-political impacts of New Deal policies on their lives. Now that it has been uncovered, perhaps Roslyn’s real history will inspire a new TV show. PULLMAN, Wash.— Popular recreation destinations today, the massive concrete fortifications at the entrance to Puget Sound silently guard an obscure past—one that piqued author David M. Hansen’s curiosity. Not content to simply wonder, the former Washington State preservation officer/historian specializing in military architecture set out to uncover the story behind the structures.